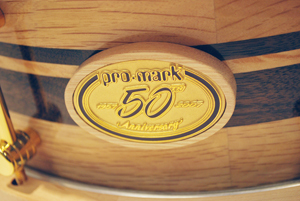 Founded by Herb Brockstein in 1957, the Pro-Mark Corporation marked its 50th anniversary in 2007. 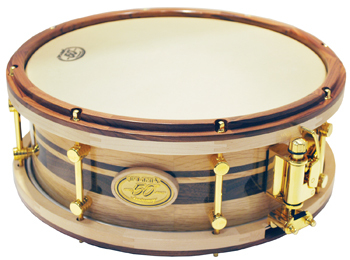 As a unique way of celebrating the occasion, the company partnered with the Stanbridge DrumA hollow cylindrical shell of any size that has a head stretched over one or both ends and is b... Company to produce a limited-edition snare drumOne of the more common drums in marching bands and drumlines and the primary drum of a drum set... manufactured with the same types of woods as are utilized in their trademark drumsticksA pair of wooden sticks used to play a drum or set of drums. Popular brands of drumsticks are P.... The production was limited to 100 14-inch diameter, 8-lug drums, 50 of which were 5 1/2 inches in depth and 50 of which were 6 1/2 inches in depth. The drum in the PASThe Percussive Arts Society is a music service organization whose mission is to inspire, educa... More collection is number 42 of the 5 1/2-inch drums. Each drum shellThe cylindrical body of the drum, usually made from plywood., manufactured using a “stave” method, was constructed of solid blocks of Japanese “Shira Kashi” White Oak, American Hickory, and Rock Maple. 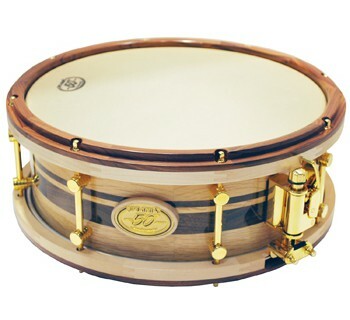 The shell was then inlaid with walnut in the company’s two trademark stripes, and the wooden hoops were capped with Pau Ferro wood for durability and color contrast. 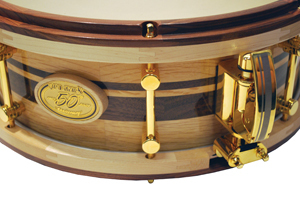 All hardware was plated in 24 carat gold, and each Remo head was custom imprinted. Designed by Ronn Dunnett, the snare throw-off mechanism is etched with the Pro-Mark stripes, and both ends of the snaresThe long, spiral-shaped wires that are stretched across the bottom of a snare drum. These wires... were designed with a quick-release slide mechanism that maintains the snare tension while the bottom head is changed. Each drum was sold in a brown hard-shell case with several accessories, including a wooden box containing a gold-plated drumkey and spare parts. Each numbered drum is accompanied by a Certificate of Authenticity signed by Herb Brockstein and Maury Brockstein.